OPPO Mobile is all set to launch its newest Selfie Expert in Pakistan, once again. OPPO’s latest offering will not only be the brand’s first full-screen model in Pakistan, but will also come equipped with an industry first Artificial Intelligence (AI) technology for capturing perfect selfies that further strengthens OPPO’s position as ‘the Selfie Expert and Leader’. The device has been designed to meet the current demands of its ever-increasing young fans in Pakistan. For the first time, the Artificial Intelligence technology has been integrated into selfies (front camera) by a phone brand in Pakistan. The Selfie Expert will feature the ground-breaking AI Beauty technology – which uses artificial intelligence from a massive global photo database, to beautify a selfie shot. The device will also feature OPPO’s first full-screen FHD+ display model, providing a vivid, visual enjoyment without increasing the size of the phone. The high-resolution screen offers a more immersive experience to consumers. The new Selfie Expert will have an updated operating system to ensure a smoother experience than previous models. The phone is expected to launch in the beginning of November 2017. Oppo phones have great displays and build quality, even the basic A37’s display will remind you of so called “Retina Displays” on iPhones! They screen can get REALLY bright and the colors are very sharp and vibrant too. I just don’t like their custom UI. It’s not as ugly as MIUI, thankfully, but it’s still quite an eye sore! And I don’t like custom ROMs, except Cyanogen Mod & Lineage OS, and both of these mods don’t support any Oppo Phone to date! 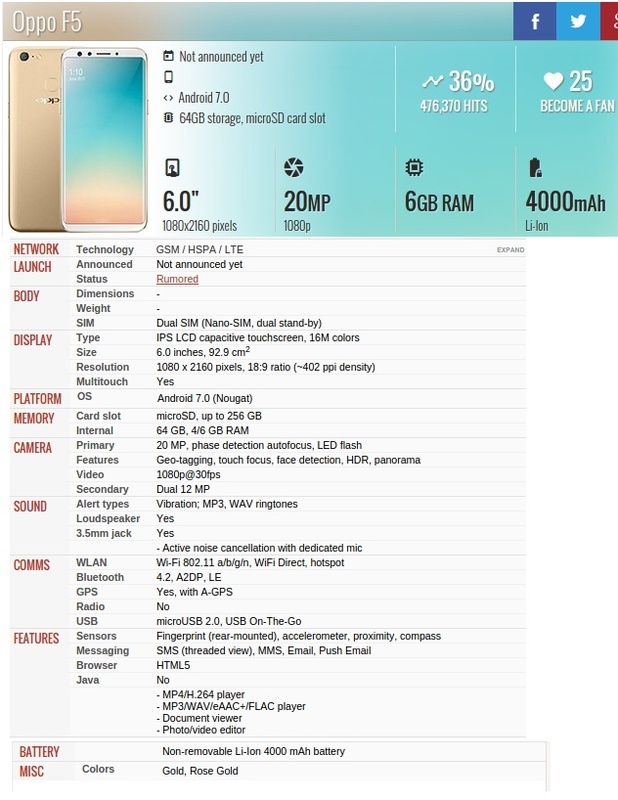 Is Main Mobiles Specs K Bare Main Kuch Bhi Nahi Likha HOWA : Par Larkio Ki Pics Zaror Share Ki Gayi hai. Yes, but the snap you so graciously posted still doesn’t mention The SoC, which is like the backbone of any smartphone! More than a backbone, I’d say! It’s The SoC that makes an iPhone; an iPhone. Or perhaps a Qmobile a Qmobile! Its Abdul WAHAB. what can you expect. This is the same phone as vivo v7 plus, they have just put oppo logo on it. Vivo and oppo belong to the same company.